Sign up for free and just shop with Confused.com Travel Insurance Quote as normal. Our average member earns over £300 cashback a year. Unfortunately we aren't able to look into missing cashback claims for this brand. There is a maximum of 3 quotes allowed per user within a 1 year period across all Confused.com programmes. Any abuse of this programme will result in all cashback being removed and your account being terminated. 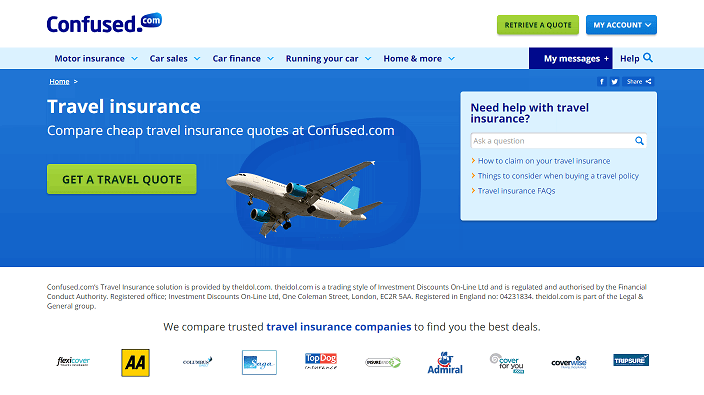 Confused.com Travel Insurance Quote cashback can be earned simply by clicking through to the merchant and shopping as normal. Confused.com Travel Insurance Quote Cashback is available through TopCashback on genuine, tracked transactions completed immediately and wholly online. Full T&Cs are on our TopCashback page. If you are looking to get a great deal on single trip or annual multi-trip travel insurance, Confused.com will help you find the cheapest policy - or the one which suits you best - by comparing up to 50 providers. Whether you are searching for backpacker insurance or cover for over 50s or pre-existing medical conditions, you can compare policies and prices quickly and, once you buy, receive your documents by email in under an hour. When you get a quote, you will see each provider's Defaqto star rating, which could help you choose your cover. If you need travel insurance for the whole family, meanwhile, you can compare policies which offer protection for up to two adults and eight children under the age of 18. To do this, select 'Family' once you have started your quote, select the party size and add the date of birth of everyone travelling. Confused.com can also provide a quote for people going on a group holiday to Europe or further afield. Whether you are all related or not, they can provide a quote for multiple individuals. Emergency medical expenses, baggage & personal possessions and cancellations will all be covered. Your policy could cover the cost of any treatment, plus transportation back to the UK if it is needed, in the event of you becoming ill to the extent that you need to seek out medical assistance. The accidental loss, damage or theft of your luggage may also be covered, as well as travel money and other personal possessions, while if your European or worldwide flight is cancelled or a family illness or bereavement results in you having to curtail your trip, the cost of that could also be covered. When considering the amount of cancellation cover you need, you should look at those policies which will repay the cost of the holiday. Whatever policy you opt for, you will find that most of them will provide a 24-hour helpline which you can call in the event of an emergency abroad. Should you or anyone in your travel party require it, Confused.com can search for policies which provide cover for pre-existing medical conditions. You will need to declare any such conditions when entering your quote details in order to be able to view policies which come with suitable health insurance cover. If you have a pre-existing medical condition, should you become ill and need emergency medical treatment or hospital care as a result of it during your holiday, a suitable policy would cover any cost which arises, subject to its conditions and any excesses. Many standard travel insurance policies exclude people with existing respiratory, heart, terminal and cancerous conditions, as well as stroke disorders, and you should be aware that if you take out a standard policy and make a claim which is in any way related to an undisclosed condition, the claim may be refused and your policy could be deemed invalid. Confused.com can find travel insurance quotes for people who love to go on cruise holidays, as you might find that standard policies do not provide the necessary level of cover for such trips. If skiing is your thing, cover any costs which should arise as a result of you getting injured on the slopes with a specialist winter sports policy. As well as possibly compensating you should you not be able to ski due to the piste being closed by bad weather or other factors, a ski travel policy could also protect your equipment and luggage. Should you need to be rescued, taking out the right level of cover is vital, while some policies provide off-piste cover, though this may require you to be accompanied by a qualified guide. Compare cheap travel insurance quotes at Confused.com. Find the right cover, whether you are backpacking around the world, going on a cruise or have a pre-existing medical condition. Get covered for medical treatment, flight cancellations, lost luggage and more. Shop for single trip travel insurance or multi-trip annual cover, as well as over 50s travel insurance, and earn cashback rewards with these great deals.